I greet each of you "Truly Happy New Years!" May 2013 be a year of wonder for all of us. This is my 2013 VISION Collage. Each year I host a vision collage making event on New Years’ weekend at my Quaker meeting. FUN! I so enjoy the process and I also enjoy living with my collage in the months that follow. This is my vision: I see the practice of massage flourishing in our homes and in our communities. Together we not only maintain the practice of using careful, specific human touch to assist healing, but together we further develop the skills used in the healing practice of massage. WOW! This is fantastic! Have you noticed that increasing automation has led to the decline of many manual skills in our society? 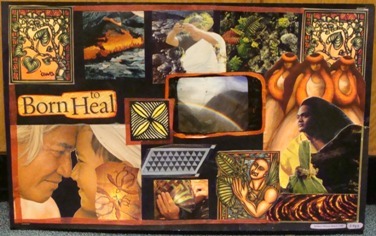 Did you know that healers in Hawaii previously knew how to heal bones in a few hours using a special, focused process? That skill has been lost, at least temporarily. If not well tended, massage could likewise be lost. I personally COMMIT to keeping the healing art of massage alive and well for our current generation and the generations which follow us. Will you join me? !!! one full tuition scholarship will be awarded !!! This exciting and life transforming workshop will be held April 12-21, 2013 in Hillsborough, NH. Click here to read more about the intensive program, including details about the scholarship. The deadline for both the regular early bird reduced price and the scholarship application is February 1, 2013. I am also offering the first two people who register and pay in full by this Saturday - January 19 - an additional $200 price reduction, for a total of $1595. This price includes tuition, room and board. • REPEAT STUDENTS (within a year) for Mana Lomi® level 1, level 2 and hot stones: $300 when paid 3 or more weeks in advance. Mana Lomi is structural lomi incorporating concepts of Hawaiian spirituality, meditation techniques, and indigenous value. Mana Lomi® is deep yet gentle bodywork which pays special attention to bones and which gives immediate & long-term pain relief. Resolve problems with clinically focused, spiritually grounded Hawaiian healing bodywork.